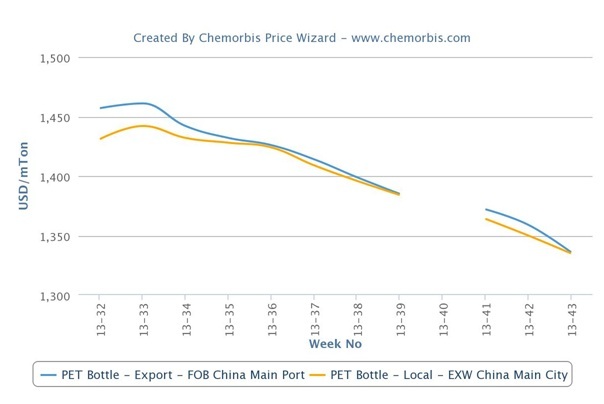 In Asia, lower upstream costs coupled with dissatisfying polymer demand and sufficient supply levels continue to pull down PET prices as per the pricing service of ChemOrbis. 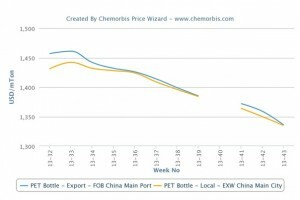 Both FOB China and ex-China based prices indicate decreases for ten consecutive weeks. In upstream news, spot PTA, PX and MEG prices are lower when compared to the beginning of October. PX prices are $40/ton lower, PTA prices are $50/ton softer and MEG prices are $45/ton lower with respect to early October levels. As a result, export PET prices both out of China and South Korea recorded $20/ton decreases on a week over week basis. In addition, operating rates inside the country are lower as there is no support from the demand side. Converters are mostly operating at reduced rates and this situation adds to the current downward trend.